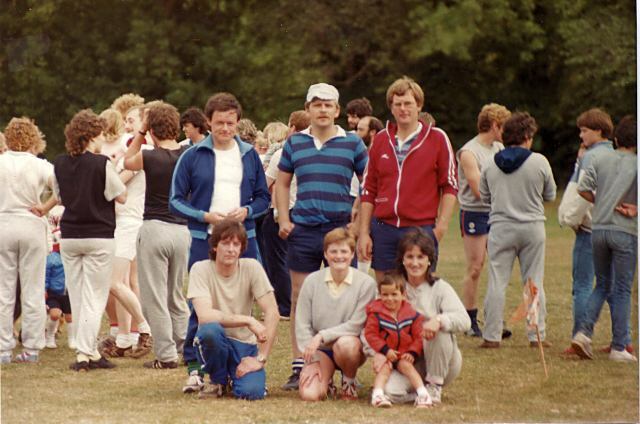 Cromarty Image Library - Gala week - 1984? In the foreground from left to right. Front - Ian MacDonald, Tricia McIver, Katie MacAuley & Ruds. Between Gordon and Robert you can see Colin Thompson and a very hairy Billy Winton. Robert even then your fashion sense was up your A@%$!!! Your cheap imitation addidas top!! The brand with 2 stripes!!! But it would be to your advantage to relocate that top and ditch the buy one get one free style that you have growen to love!!!! Loving the cap Dad!! And the socks!! Behind Robert Hogg's left shoulder I think is Roy Auld who worked with us at the salmon fishing - he stayed with Hamish Stuart.